(2) Those documents are to be prepared by or under the supervision of a professional engineer, hydrogeologist or scientist as those terms are specifically defined in NR 712.03. This rule chapter requires: (1) appropriate qualifications of the consultant; (2) signatures; and (3) certification language to be included with the appropriate NR 700 submittals. 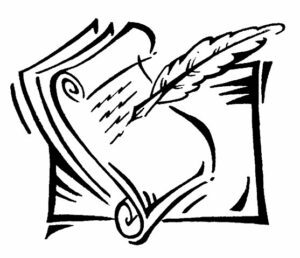 Semi-annual reporting for the period of January 1, 2017 to June 30, 2017 is due August 8, 2017. Semi-annual reporting is required of responsible parties (RPs) for all “open” sites, including those sites the DNR formerly classified as “conditionally closed,” in the BRRTS online database. Consultants may submit these reports on behalf of the RPs. An email from the DNR with your unique report identification number will go out on July 7, 2017. If you do not receive an email, you can request a number by submitting the Report ID Request Form. The Report ID number you will receive uniquely identifies the activity for which you wish to report, the reporting period, and verifies the person using the ID is authorized to submit the report. If you have any questions, please contact Tim Zeichert at (608) 266-5788. The Remediation and Redevelopment (RR) Program is taking steps toward making site file records available electronically via BRRTS on the Web (BOTW). To assist with this goal, the program encourages consultants to submit NR 700 milestone documents via email to a regional email address and to the project manager instead of submitting a CD or DVD. The RR Program reminds consultants that both electronic and hard copy submittals are required (as well as the fee, if applicable) before submittals are considered “received” by the department. Documents can either be provided as an email attachment or uploaded to the RR Program’s FTP site (if the files are over 12 megabytes). NR 700.11(3g) allows the department to issue this blanket pre-approval for email submittals. By following the recommendations in the submittal guidance, consultants will help RR staff identify and review documents in a timely manner. RR Program staff have updated the popular “Reporting Hazardous Substance Spills” (RR-560) publication, available online for posting in your office or sharing with clients and colleagues. Wis. Stat. § 292.11 (2) and Wis. Admin. § NR 706.5 require individuals and entities that possess or control a hazardous substance, or that cause the discharge of a hazardous substance to the environment to notify DNR immediately about the discharge. RR-560 summarizes reporting requirements, reporting exemptions, and DNR spill coordinator contact information. RR-560 is intended for use in businesses and other places where hazardous substance spills may occur, so that reporting requirements can be quickly determined and followed. It is also useful for local governments, environmental consultants, and individuals involved in commercial/industrial property construction and development. Responsible parties and their consultants are reminded that reports due to the RR Program under NR 700.11 must contain one paper copy and one electronic copy. The electronic copy helps the RR Program make these documents available in the Bureau for Remediation and Redevelopment Tracking System (BRRTS) and through BRRTS on the Web (BOTW). If you have questions about this requirement, please contact your project manager or Judy Fassbender, (608) 266-7278. The RR Program’s mid-year report to US EPA, which details outputs and outcomes funded by a federal grant, is now available for review. 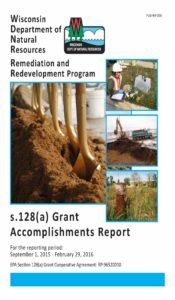 The Section 128(a) Grant Mid-Year Report, for the reporting period of September 1, 2015 to February 29, 2016, highlights work completed in the first half of the funding year. Since 2003, the RR Program has consistently and efficiently used these funds under a cooperative agreement with the US EPA to enhance state efforts with brownfields cleanup and redevelopment. Previous reports can be found on the Brownfields Program web page.